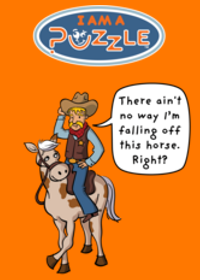 The Math Mom: The game of my childhood: Bulls and Cows or Mastermind. The game of my childhood: Bulls and Cows or Mastermind. Post-Cold War Russia of 1980th. We still believed that US is a threat and a serious competitor in the life style, science, sports and space. In school we trained to assemble and shoot from Kalashnikov and run to the bomb shelter (each school was equipped with one since World War II). I recollect perceiving US as a country of chewing gum, handsom guys like Tom Cruise, brown paper supermarket bags and homeless people sleeping under the bridge. The rest of my childhood was pretty much like yours - cartoons; after school sports, music, ballet; weekend ski, hikes, or friends and family gatherings. One of the games I remember enjoying playing was a code breaking game named Bulls and Cows. All you need is a pencil and paper. Pick a 4 digit number with all the digits being different. This is your code. Ask your friend to break your code - guess this number. You write my number under your number and see how many digits match. If I guess a digit correctly and it is in the same position as in your number, it is a "bull." Same digit but in a different position is called a "cow." You tell me 0 bulls and 1 cow. Perhaps you played this game as well - in US, Brazil, Egypt or Israel. Math is not only a universal language but also a toy shared across continents, cultures and regimes. According to Wikipedia, Bulls and Cows was known around the globe for hundred of years. Nowadays, most of us here in US know and love this game as Mastermind - with color pegs instead of the numbers. The colorful version - Mastermind - was invented in 1970 by Mordecai Meirowitz, an Israeli postmaster and telecommunications expert. Apparently, his idea was at first turned down by many of the leading toy companies, but he persisted, and took it to the International Toy Fair at Nuremberg where a small English plastic company bought the IP rights and made it the most successful game of the 1970th. If you think something was sexist in the name "Bull and Cows", check out the peculiar original Mastermind box cover that called it a "Game of cunning and logic for two players:"
Practice your logic skills with this Bulls and Cows, also known as Hit & Match game. Recommended for ages 10-100, parent assistant is advised for younger kids. We love this game! 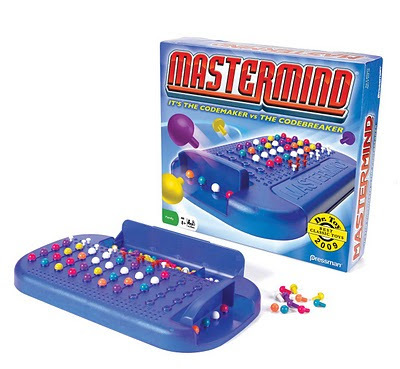 We have the young children's version (Mastermind for Kids) and my kids loved it when they were little. My youngest 3-year old is not ready for it yet. 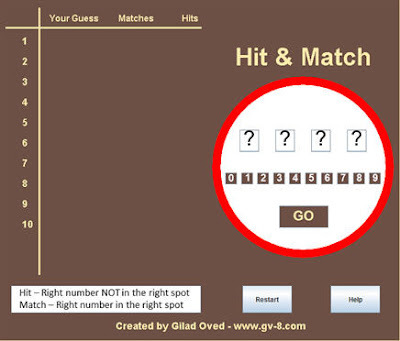 I am going to try it the way you played it as a kid- it is an good game to play at a restaurant or in the car. Thanks for sharing this post, sharing personal accounts from childhoods in other countries is just as valuable as sharing that fabulous game! I spent endless hours playing in school and in college. It kept me sane during all these “History of Communist Party” classes. I don't think the cover of Master Mind is sexist. A little odd maybe. Has a 007 bad guy air to it. Where you able to find it in assembly? Game online a lot of people who love to help them relieve stress of the moment, such as TinyTanksandTinyPlanesorTiny Planes Beta is the fighting game with a pen or pencil, you have to destroy opponents before they kill you. Or Run 3 Unblocked and Hacked unblocked Gamesare skillful game controller for bears to dance to the goal without falling off a cliff. I wish you happy gaming! With football we always have exciting games such as head soccer and head soccer unblocked and soccer heads and head soccer 2 or big head basketball big head soccer or head soccer will bring to everyone the good entertainment Best.